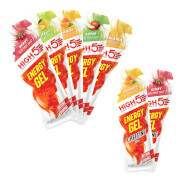 High5 is a UK company run by athletes. They have competed in many of the world's toughest events and have years of racing experience between us. They know from personal experience just how important it is to get your nutrition absolutely right and what it takes to make a great sports product. High5 has close links with Universities and teacher research groups and by combining our practical no-nonsense approach with the latest developments in sports science, it means that High5 products are always leading edge. Keep yourself hydrated with this PBK exclusive hydration bundle designed to help athletes rehydrate, as well as replenish electrolytes, carbohydrates, and other nutrients, which can be depleted during and after training or competition. 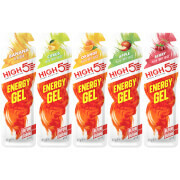 EnergyGel is smooth with a light consistency and a dash of real juice for a great taste. It's not thick or overly sweet. Easy to open and swallow, each sachet contains 23g of carbohydrate. EnergyGel is award-winning and proven in many of the World's toughest competitions. Race proven in the World's toughest competitions. Real juice flavours for a light refreshing taste. Easy to carry and open. 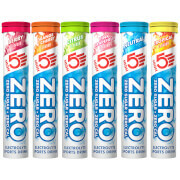 ZERO is the UK's leading electrolyte sports drink tab. It produces a clean-tasting and highly refreshing drink with zero calories. The tabs contain light natural flavours with no artificial colours or preservatives. ZERO contains Vitamin C and 5 electrolytes, including sodium, magnesium and potassium. Vitamin C in ZERO supports a healthy immune system, protects the cells from oxidative stress and contributes to the reduction of tiredness and fatigue. Magnesium in ZERO contributes to electrolyte balance, reduces tiredness and fatigue, whilst supporting muscle protein synthesis. During exercise, athletes can be at risk from Hyponatremia, also known as water intoxication, which is generally the result of drinking excessive amounts of plain water with no electrolytes during endurance events. This causes a low concentration of sodium in the blood. A study published in the New England Journal of Medicine (April, 2005) found that 13 percent of Boston Marathon runners developed Hyponatremia from drinking too much plain water. Simply drop a tab into your re-usable sports bottle and watch it rapidly dissolve. With minimal packaging, ZERO is environmentally friendly and easy to keep with you. The easy-break tabs mean that you can choose your ideal drink strength. Light & refreshing sports drink with a hint of fruit. Including Vitamin C and electrolytes, including sodium, magnesium and potassium. Suitable for a wide range of sporting activities. With natural flavours. No artificial colours or preservatives. This is a UK product in UK packaging.